I love to craft and create in my spare time, and now that the children are older I love the fact that I can continue with my own crafting while they get on with theirs - I don't just have to sit and watch them splash paint and glue about and then clean it all up after them! 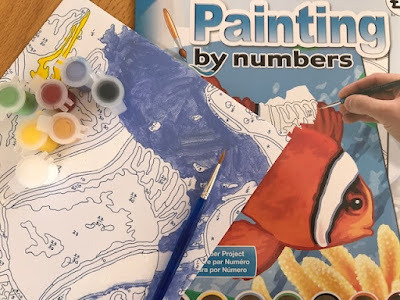 I thought I'd share some crafts I've found that are really fun to do alongside your child, either working separately or together. 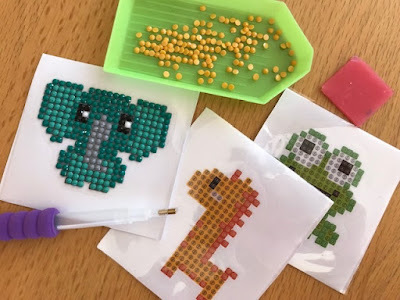 My favourite craft to do with the children is Hama beads. They aren't just for children, and in fact I've written a whole post sharing ten Hama bead projects for adults. All you need to get started is some beads and boards, like this big bucket of Hama beads and boards (affiliate link), then you can add more supplies as you go. The mini beads are also great for adult crafting projects, as they allow you to create more intricate designs like my tiled Russian Doll picture. A new craft that I recently discovered is diamond painting, and this is another craft that both children and adults can enjoy. You can either work together on a larger piece, or choose some simpler designs to get children started. I recently bought this diamond painting sticker kit (affiliate link) which was a big hit, there are lots of small designs included that can be finished quickly and used as sweet little stickers for phones or notebooks. Colouring together is lots of fun, and there are lots of different colouring books that you can buy that allow two people to work on their colouring together. I really like this Colour With Mum colouring book (affiliate link) which has designs that vary in difficulty so that you can choose who gets to tackle which picture. A step up from this is painting by numbers, something else which my children really enjoy. You can find lots of child friendly designs like this one - Pug dog with flowers (affiliate link) , or you could work on a larger piece together with the adult doing the more tricky areas. All of these crafts leave you with a finished piece that you've worked on together which is a lovely memento of the fun that you've had crafting together!